Thomas Gainsborough, the famous English painter, loved dogs and often included them in his paintings. Sometimes, they were even the main subject, like in this picture, above, titled Tristram and Fox. 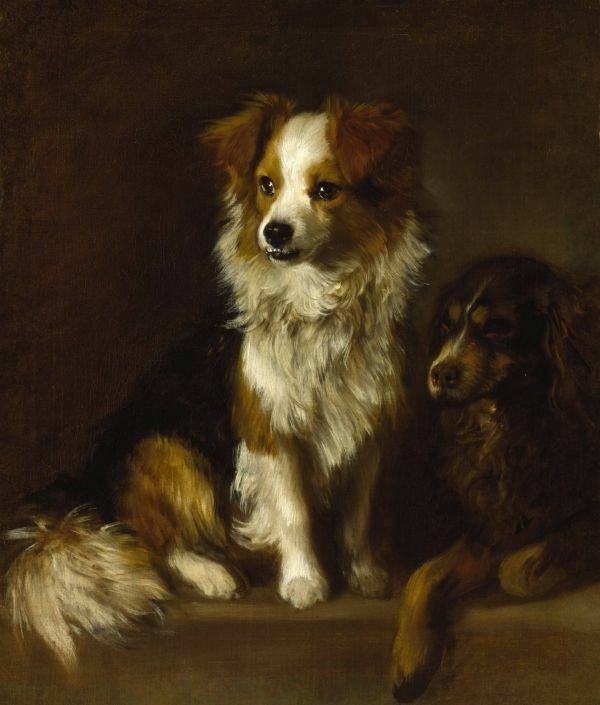 Tristram and Fox were two very special dogs: they were Gainsborough’s. After painting their portrait, the artist hung it in the place of honour in the house, over the chimney piece. Gainsborough had a sense of humour and he showed it when naming the dogs. A staunch Tory, the painter named Fox after the Whig politician Charles James Fox. The slightly fox-like appearance of the dog may have had something to do with it as well. Tristram instead was named after the hero of the novel “The Life and Opinions of Tristram Shandy, Gentleman” by Laurence Sterne. It is difficult to say which breeds the dogs belong to as modern breeds can look quite different from eighteenth century ones. By looking at the portrait, we may surmise that Fox, with its pointed ears and white frilled collar, belongs to a collie-like breed. Tristram instead is a spaniel.